This extremely good-looking house should properly be called ‘Goodwin House’ as it was owned by the rich and powerful Goodwin family of gentleman farmers who, from the 1780s to the 1840s, owned or tenanted five farmsteads in the village together with most of the valuable agricultural land. When John Goodwin the younger died intestate in 1844 the rival claims of his extensive family eventually led to his property being sold by order of Chancery. This sale released a huge amount of land on to the market in 1875, just as demand for housing was rising, and contributed in large part to the development of the village as it is now. Goodwyn House itself is much older than it looks The symmetrical redbrick front of the early 1800s conceals an earlier building which can be traced back through documents to the sixteenth century, though its history is much less clear than that of many other houses in Datchet. Its name had become Goodwyn House (in a deliberate ‘ye olde’ version of the family name) at least by the 1870s. 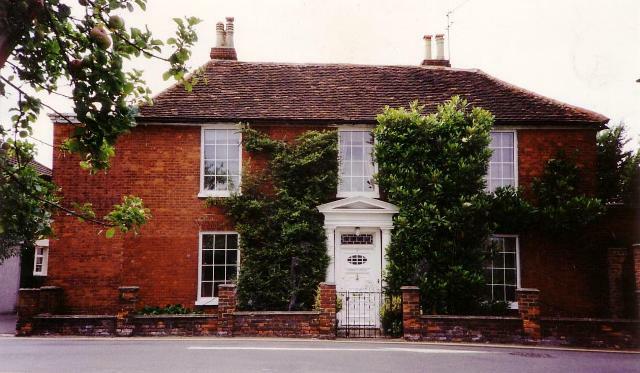 Until recent times the house had changed hands very seldom; following the Goodwins John Miller Spalding lived here from about 1860 until about 1900, and then Ernest Mumford and his family right up to the 1950s. John Goodwin the elder first appears in Datchet in the 1770s and died in 1815. He appears to have had no children by his wife Ann Piper whom he married at Langley Marish in 1779. His heirs were his two nephews, John junior and Ralph, and two nieces, Sophia and Anne. All four of these intermarried closely with the Willis and Ive families of Langley and produced children who were given their mothers’ family names and further married back into those families. On Ralph’s death in 1823 his share of his uncle’s property was protected by his own will, but in 1844 John junior, who had received much more (including Goodwyn House) failed to do so and the Ive and Willis families contested for their shares over the next thirty years. In 1778 John Goodwin had bought the house and surrounding land at 20 High Street,now known as Margaret Partington’s Hat Hire Shop, plus the workshops behind it in Queen’s Road. 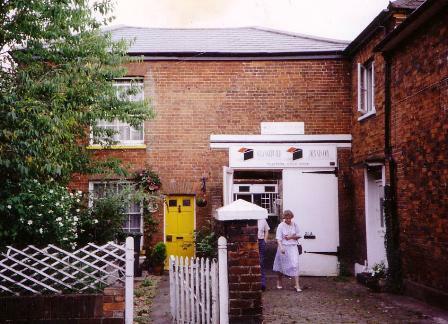 The adjacent Thames Cottage was also part of either the Goodwin House or number 20 premises. In a county militia list of 1798 both a John and Ralph Goodwin are described as butchers, so it is possible that the two nephews ran this business under their uncle John’s ownership from number 20, which was still a butcher’s into the 20th century. Some of John Goodwin’s property had belonged to the Marsh family who had previously been the dominant farmers in and around the village, both as owners and tenants. In 1794 their heir, John Fleetwood Marsh, sold up and left for America as a nonconformist zealot in search of religious tolerance, and John Goodwin bought houses and land from him at that point, including Goodwyn House. 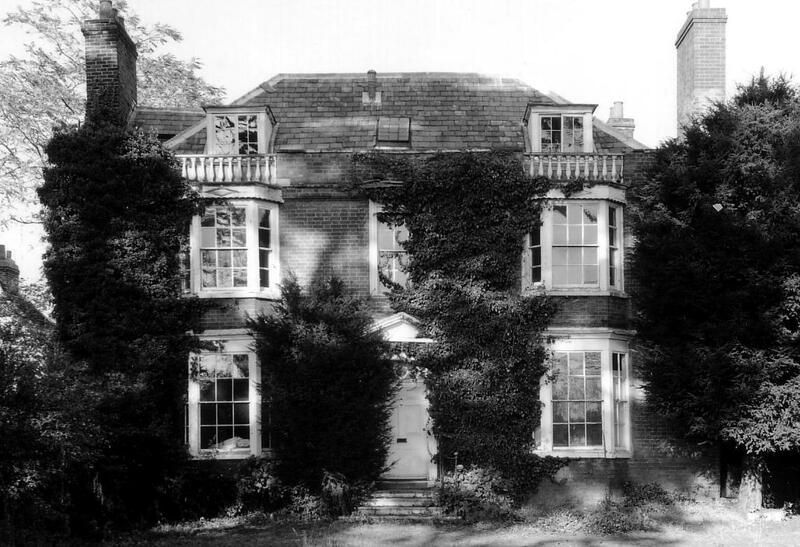 By 1800 John Goodwin had also bought the homestead and land belonging to Eton College (which he had previously leased) and was the tenant farmer at Ditton Park farm and Rectory Farm, though he would probably have employed bailiffs to manage these estates. Goodwyn House had almost certainly been owned by the Marsh family as a farm homestead, since much reduced by the railway line around 1850, since a barn there was let by John Fleetwood to the Baptist group in 1785 as a meeting place. It is presumed that John Goodwin did not buy the house and homestead until about 1794. John Goodwin the elder added a new block to Goodwyn House, very much as at 20 High Street, greatly enlarging and improving the place but not demolishing the much older house behind. But this was not his only venture into fashionable house building at the height of his wealth and power. In his first will of 1806 (he did not die until 1815) he described as ‘newly built‘ his house, known later as Satis House on Horton Road(now demolished). This was much bigger and more fashionable for its time than Goodwyn House. Furniture of bedrooms and parlour and bookcases with wired and glazed doors, two 8-day clocks. some beautiful enamelled china in bowls, cups and antique teapots, useful glass, urns and plated articles. 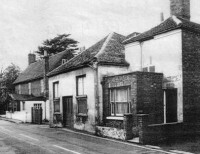 John junior had received the bulk of the land owned by his uncle together with Goodwyn House and an ancient farmstead and cottages on the opposite side of the High Street (site of the railway station, The Avenue and Eldertree Cottage) plus the Eton homestead (partly now Hall Court). All this was sold in 1875 but continued to be occupied by the family or tenants until the Chancery case was resolved. John junior’s wife Mary Ann Willis Goodwin lived at Goodwyn House until her death in 1858, when her will shows that she had property of her own elsewhere from her father, which she then bequeathed to her son Ralph Willis Goodwin. While this Ralph Willis was living at Goodwyn House he was described as a farmer of 400 acres, employing 12 men, but this was as the manager of the Lascelles’ Southlea Farm, not his father’s or great uncle’s land. John junior and Mary Ann’s other son, John Willis Goodwin, became the farm manager for the Rectory estates of John Richards and in 1841 was living at The Dutch House farmstead next to Astracot in Horton Road. Richard Gallys was Mayor of Windsor in 1561, 1566 and 1570 and landlord of the Garter Inn. It is thought he was the model for Shakespeare’s host in The Merry Wives of Windsor as written in about 1597. He was also an MP for Windsor and an outspoken protestant during Queen Mary’s Catholic reign. 1671: Manor Court roll, Anna Pritchett sold a freehold messuage & 50 acres to William Loader of Wallingford. 1675: Dr Thomas Browne sold all lands in Datchet (purchased of William Loader) to Dr Isaac Voissins. Isaac Voissins’ property was eventually inherited by the Lascelles family, Earls of Harewood. The Lascelles gradually sold all the houses they did not require, especially those in the village centre, keeping only the huge estates of land, and it is assumed, though at present cannot be proved, that the Marsh family leased or bought the Goodwin house from the Lascelles at some time in the 1700s.